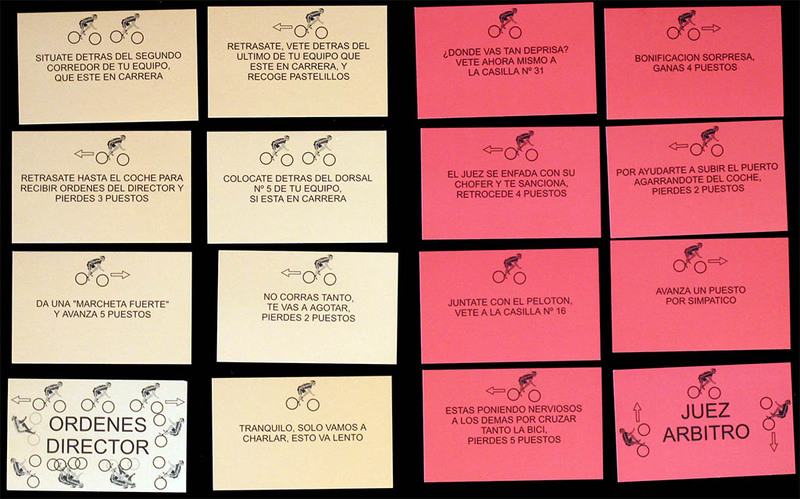 This is a little-distributed Spanish game, of which I am not even able to say the title. 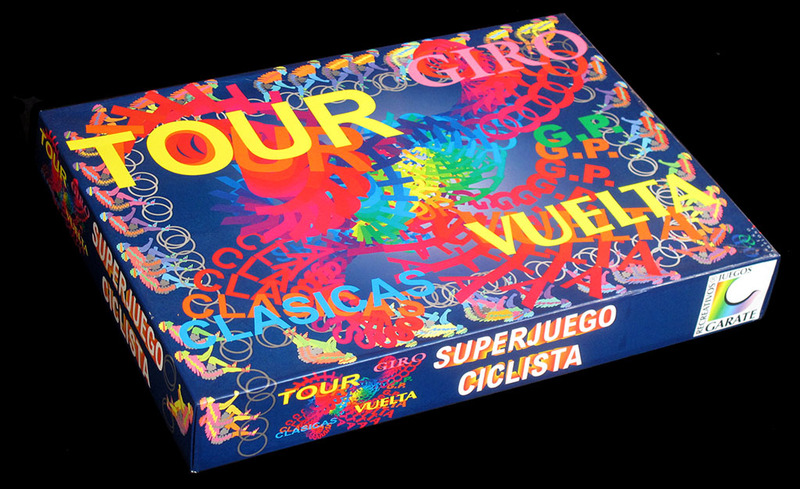 As you can see the box top just says "Tour Giro Clásicas Vuelta" while on the side and in the rules you can read "Superjuego Ciclista" (which just means "Cyclist Supergame"). As far as I am concerned, this is the title of the game. 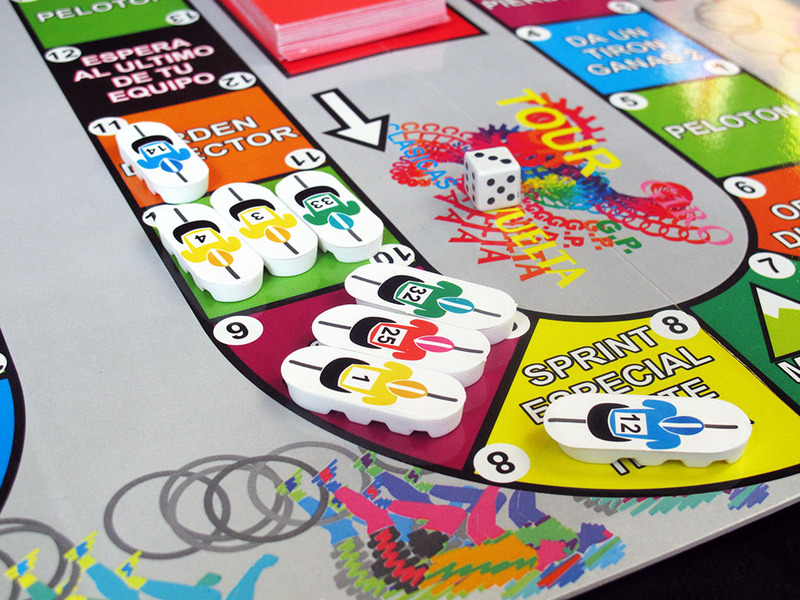 Whats is worse, although the game has the name of a publisher (Juegos Recreativos Gárate) and a designer (O & D Diseño Pamplona), it doen sot seem to have been legally registered anywhere. The information on this game is really scarce. 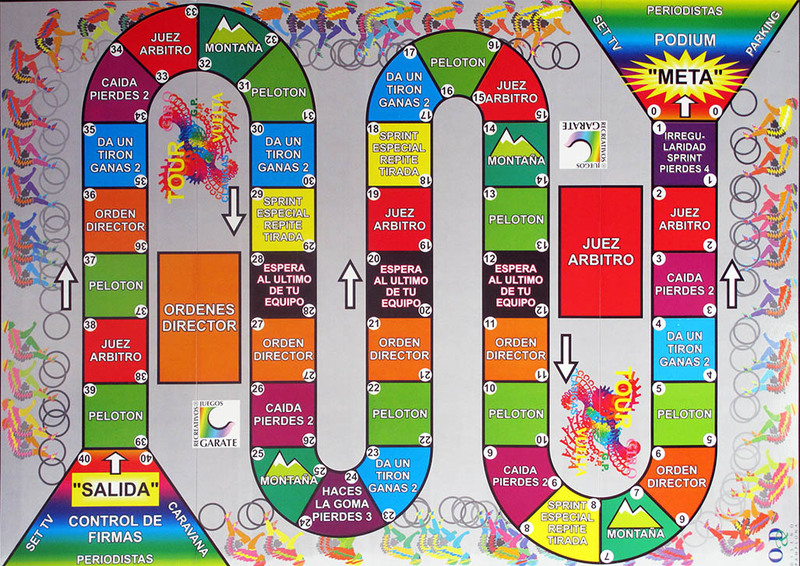 The game is big enough (the board measures 59 x 42 cms and the box is 43,5 x 31 x 6 cms). The quality of the components is quite poor, though I have seen worse. 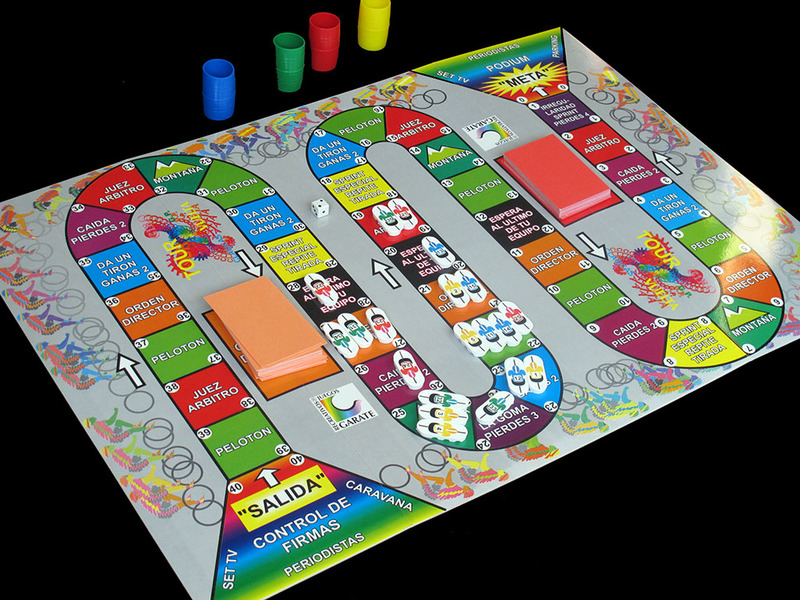 There is a (cheapo) plastic dice shaker and a die for each player, which is quite common in Spanish games. What is not so usual are the flat riders. These are made from a plastic oval with a sticker pasted onto it. They are the game component of better quality (which is not saying much anyway). There are 20 riders, divided in 4 teams of five riders. 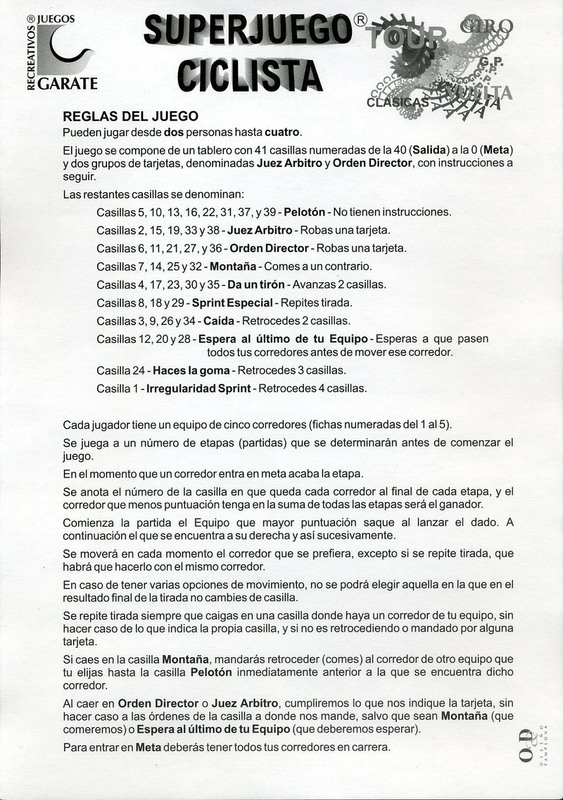 The rules do not mention a limit of riders on a square, but I would say that more than three have a problem, as you can see on the picture below (check square 22). By the way, I have not misplaced the riders. The numbers on the squares are in descending order. This is not frequent, but has an explanation: This is a stage race; when the first rider reaches the finish line the stage ends and each rider adds the number of the square he is on to his GC count. 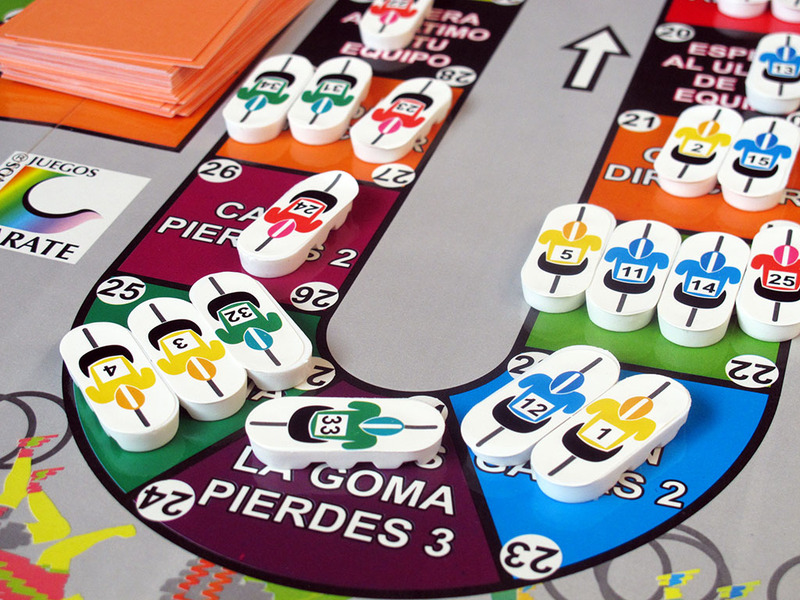 One each turn, the player throws his die and decides which rider he wants to move (unless the rider falls on a "special sprint" square, in which case he throws again and moves the same rider). While this decision-taking can make a potentially interesting game (like, for instance, La Grande Boucle) this is not exactly the case here. The winner of the race is the team with the best rider (as opposed to "the best team") so the best tactic is to move your leader as often as possible, and just move the other riders when the throw would make the leader fall on a harmful square. However, there are many potentially harmfull squares (including those who make you draw chance cards), so the rest of the team will eventually move. Just in case, there is a rule that says that you cannot cross the finish line if you have riders that have not started the stage yet. 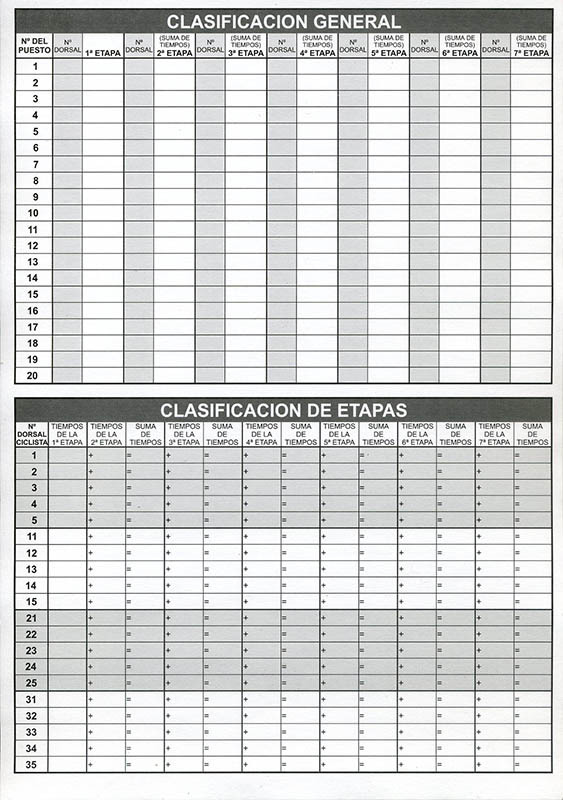 Score sheets included in the game.